The Nokia 215 Dual SIM mobile offers a complete package of basic connectivity and utility features in a sleek, compact package. Equipped with a 2.4inch TFT display, the phone generates 240 x 320 pixel resolution visual performances with ease. The preloaded media player and stereo FM radio provide much needed entertainment in your spare time. Available in a sleek black color, the phone’s polished finish is sure to grab attention. The phone features a sizeable internal storage space that can save info of multiple contacts, messages, and much more. A long lasting battery eliminates the need for frequent charging, enabling you to play/work for extended hours. 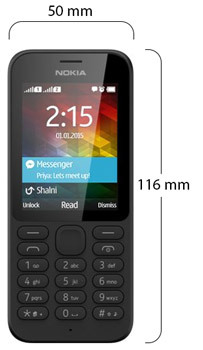 The Nokia 215 Dual SIM weighs just 78.6g and has dimensions measuring 116 x 50 x 12.9mm. The compact footprint makes it easy to carry the phone even while traveling. The phone sports a 2.4inch TFT color screen that generates 240 x 320 pixel resolution images with 256K color output. These images also feature a pixel density of around 167ppi. The phone features a stylish alphanumeric keypad and a Navi key which eases out the typing and navigation while using the phone. The Nokia 215 Dual SIM operates on a propriety OS that effectively simplifies the phone’s user interface. The device’s built in 8MB RAM facilitates glitch free multitasking between different open applications. Important tasks, schedules, and dates can be efficiently managed on the Nokia 215 Dual SIM with the help of its installed organizer application. Its voice memo lets you record audio clips of lectures, interviews and more. Soulful MP3 ringtones serve as alerts for messages and alarms together with pulsating vibrations. Messaging features of the phone such as SMS and MMS make it possible for you to stay connected with the world from virtually anywhere. You can even access your social networking platforms on this phone. You type out these messages faster and with greater accuracy, thanks to the device’s predictive text input feature. The device’s installed games, stereo FM radio, and a multiformat media player help you while away those boring hours. The Nokia 215 Dual SIM can accept two different SIM cards of GSM networks. The phone features a WAP 2.0/xHTML browser, which permits faster loading of web pages and web content. Wireless transfer of data with Bluetooth enabled devices is possible with the inclusion of built in Bluetooth 3.0. The phone also incorporates a microUSB port that facilitates high speed data transfers between this device and your computer. The Nokia 215 Dual SIM is powered by an 1100mAh Lithium Ion battery that offers a substantial standby and talk time. The phone has a sizeable internal storage space that can store details of up to 1000 different contacts. Insert a microSD card is the provided slot and increase the available storage space by up to 32GB.